Two big news bites. First, simply that Disney has announced we'll have Star Wars Land in 2019 here in SoCal. 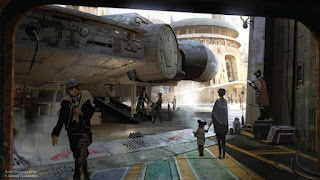 From what's been revealed so far Disney claims you can get on the Millennium Falcon and tour the worlds from the Star Wars Universe. There's still scant details about what'll actually be there and the Disney Parks blog is really terrible at explaining it. "At each location, guests will be transported to a never-before-seen planet – a remote trading port and one of the last stops before wild space – where Star Wars characters and their stories come to life"
What? So the planets we're going have never been in Star Wars? Wild space? Secondly, E3 is going on sale to the public this year. One Feb 13, you can buy a pass to E3, first at $149, but that's only for the first 1,000 pass buyers. After that the price jumps to $250. Both prices will get you a three day pass. Here's the other thing, the passes only number 15,000. Tickets go on sale here. E3 will take place here in LA, Jun 13-15.